There seems to come a point at each stage in life where little annoyances swell of their own accord into seemingly insurmountable problems, turning into a barrier that apparently cannot be crossed. Understandably, that is fertile territory for novelists be the stage childhood, adolescence, middle-age or impending senior citizenship (see Julian Barnes The Sense of an Ending for an outstanding example of that stage). — Alan is a university art teacher in Belfast, recently divorced after 20 years of marriage because of a one-time dalliance with a mature student that lasted scarcely an hour in a sculpting studio. He confessed and it proved to be the excuse for his wife to end a union that for her obviously was withering with age and experience anyway. As the book opens, she and her new lover (a contractor) are set to head to Spain to look at a property she wants to convert into a bed-and-breakfast to begin a new life. Adding to the family issues, their 16-year-old son is going through his own adolescent version of scaling a life wall. And just to complicate Alan’s dilemma, his boss (a colleague from student days) has warned him that his post is at risk since he has neither published nor had a show for years. — Karen is a single mother who works two cleaning jobs to support herself and her 20-year-old daughter, Shannon. Shannon’s father deserted Karen when she was 20 herself and three months pregnant (the prospect of fatherhood was just “too much” for him to face). Life is about to change for Karen because Shannon is engaged — a “hen party” in Amsterdam to which Karen is invited is the defining event that provokes her crisis. And, just to increase the complexity of her situation, she too faces a work issue — a resident at the senior citizen’s home where she works has “lost” a bracelet and the investigation has left her thinking that she is suspected of taking it. — Marion’s life appears to be just fine. She and her husband, Richard, have spent decades establishing a garden centre that is prospering. But his last present to her — a year-long membership at a tony gym that she wants no part of — has convinced her that he is tiring of her and that his eyes are wandering. His friendly relationship with a couple of attractive Polish workers in the centre has led her to the notion that he intends to take up with one of them. All three are about to head off from Belfast (religious, moral, tightly-controlled) to Amsterdam (secular, free-wheeling, anything goes) for a weekend. For Alan, who fondly remembers the city from his hippy phase, it is a concert by the aging Bob Dylan that is the attraction. Karen has never been there (indeed, never been on an airplane) and has no desire to go — she not only doesn’t want to be part of a hen party with a gaggle of 20-year-olds, she has questions about how suitable her daughter’s choice of mate is. And for Marion the “weekend away” (holidays are not something that she and Richard have been able to fit into the schedule) seems to signal another stage in the end of her marriage rather than a pause for rejuvenation. Perhaps the flight was her moment of initiation and if only she could endure it then everything would be open to her. Her hands gripped the armrests as the engines started and the plane began to move along the runway. She told herself that she was brave enough for this, had already shown how strong she was from the moment when three months pregnant she had read his letter telling her that he was leaving. Written in pencil on a page torn from a spiral notebook, the edges had little curls of white that flaked away in her hand. So he wasn’t ready to be a father, it had all been a mistake, it was better to put things right before it went any further, he was sorry but it was better to be honest. He had tried, really tried, but it was of no use. Of course he hadn’t told her that he had met someone else — she would find this out only later. It was a page taken from the book he used in his PVC windows business. He had made her a customer and was settling the account. 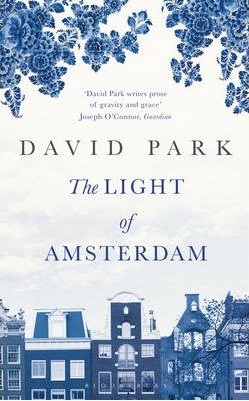 In the “freedom” of Amsterdam, all three characters will look not just at what they perceive as their present crisis, but also the past that produced it. Their paths do cross in the Dutch city but that is more a novelistic convenience than anything else — this is a book about how three people come to terms with their similar, but highly individual, challenges. For this reader, Park succeeded in making each of his characters an interesting study. At times, each gets his or her own chapter. In other chapters, he alternates with sections for each of the three. The usual problem with books that use this technique is that one of the characters becomes more (or, worse, less) interesting than the others and the book gets choppy — Park succeeded in balancing all three stories and it was easy to move with him when he shifted focus. It is an introspective book, so that balance is important — he brought all three to life and I found myself caring about each of them. In their lives, the three are “ordinary” people; in the novel, Park makes each “special”.